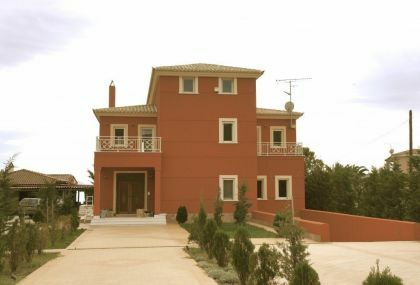 Two luxury villas with swimming pool on a large plot offered for summer rentals in the Peloponnese. The villas are located near Porto Heli, the famous resort with good infrastructure and are available for rent together or separately. 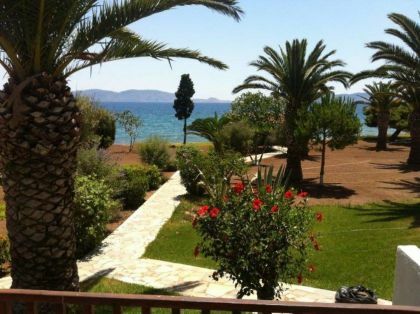 The villas are located on the sandy beach and have open panoramic view of the sea and Hydra Island. Each villa has 2 levels, 6 bedrooms, 6 bathrooms, a spacious living room, dining room, well equipped kitchen and other facilities. The living room has a fireplace, all rooms air-conditioned. Kitchen equipped also with dishwasher, microwave oven, toaster and coffee-maker. Large terraces overlook the picturesque bay and hills are near the pool. Both villas have direct access to a large swimming pool surrounded by sun loungers and comfortable sofas. Blossoming exotic garden and green lawn are just one step from the sea. There is a barbecue area and parking for 8 cars.